and an upcoming paintballing session on saturday, not me, I'll be reading magazines and drinking tea and coffee! oh and making sure they have their gear on properly and rationing out the paintballs! 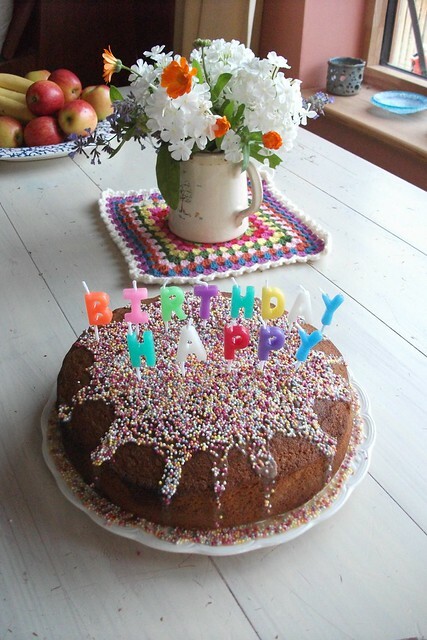 my very simple version of a birthday cake, slightly strange icing and sugar balls! I have a son who likes very plain things, no need for mountains of fluff and icing, just a straight forward spounge cake, that's him! the gorgeous smell of apples and blackberries has been scenting the air. Nothing else added except for a large dollop of natural yoghurt. Yum. 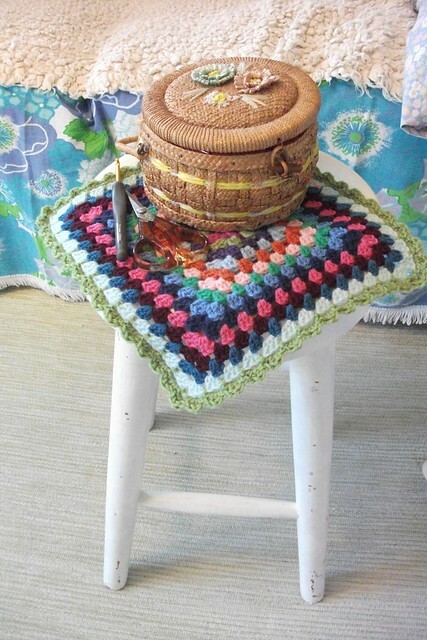 on the crochet front, more pot holders have appeared. It's a nice way to play around with colour. Sometimes I find myself going down an unexpected route with the colours. A gentle autumn trail into the new seasons colours. I found myself bringing out the plum and the russet and deepening the colours, and wishing for more rusts and browns. I've just started darning in the ends of the thread instead of crocheting over them. Well actually I'm doing both. I think this does make them more durable, especially if I'm making things to sell and it's quite quick and easy with an embroidery needle. So I practised on this. Here is my little sewing box, given to me by my mum when I was about seven. It's just holds the essentials! some things just keep on going! it was a well timed present, and the beginning of good things. I still love looking in sewing baskets. I thought it would be nice to give a cheery wave and welcome to all the new folks who have called by here lately. It's just lovely to hear from people near and far and across all the different time zones. Wishing all of you a good weekend. 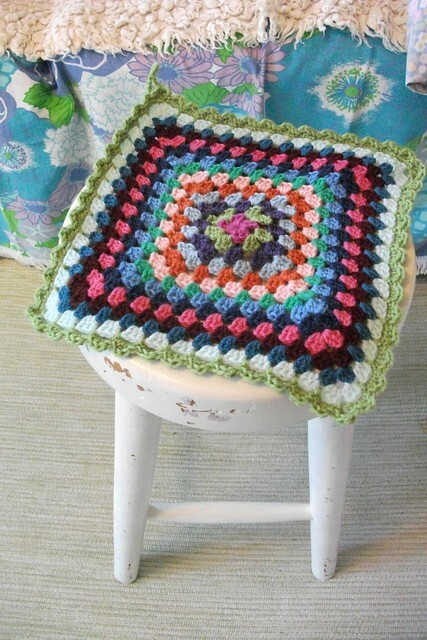 Lovely lovely little granny square, gorge combo of colours and just the right size to sit on a stool - I think I need to get making! The cake : simple (;oD) and yummy!!! Happy belated Birthday to your son!!! Happy Birthday to your kiddo! I hope the school front gets better - last year was a rough one for us, but this year we're predicting 'sunny skies' :) Lovely crochet piece - I really like the colors. I've knitted, but always wanted to take up crochet. You inspire! 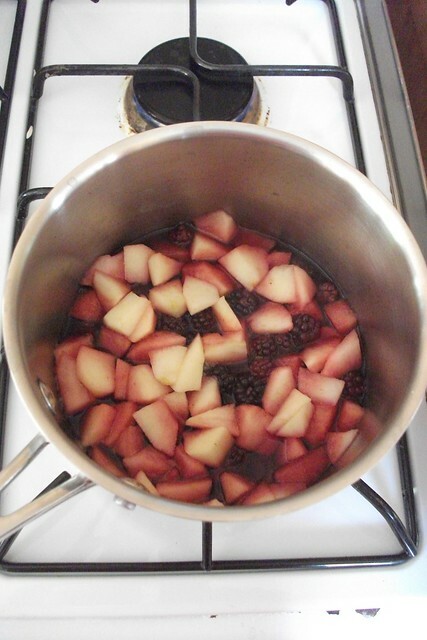 I can literally smell those apples and blackberries, probably because I have the self-same thing cooking here! Gorgeous flowers in that jug! Lovely to see snippets of your week. What a gorgeous little sewing basket. Nice that you still have it from your childhood. I too am all about the cake. Except maybe a good creamcheese icing. Your icing job looks like a big paintball splat! How appropriate.